Last Saturday night I found two things at the Lantern Festival. 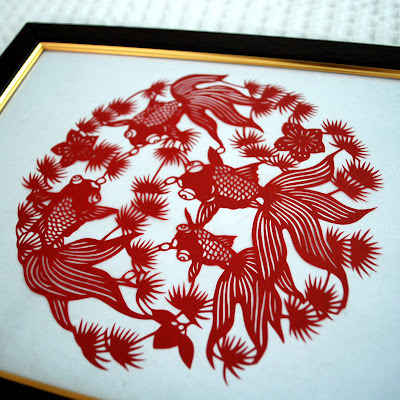 The first was the paper cut above – I loved the red fish in a circle. It was the only one like it, and it was displayed in this dinky little frame, but the seller let me have it from the display and I was really excited. I’ll probably reframe it in a square which will look much better with the circle. I’m so glad I decided to get it (even if it was later in the evening when I decided, which meant I had to run back in the heat to grab it). Totally worth it. The second find was actually found by the grandmothers in the group. 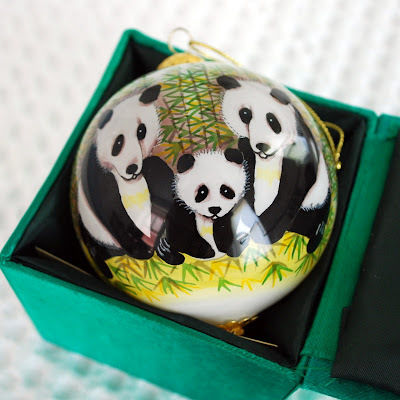 M’s mom got the girls this ornament, and my mom got my sister’s kids one as well. I thought it was perfectly fitting since the kids all really loved the panda lanterns at the festival – plus we always try not to go overboard with souvenirs – except for ornaments. I love pulling out the reminders of our adventures and travels each year at Christmastime.